It inspired me to make this moodboard of all things cake! 1. Eline from a Fluffy Blog 2. Birthday Cake by Sweetapolita 3. Kimbra 4. Peachy Pink Lace Dress 5. Eline again ^.~ 6. Birthday Cake by Sweetapolita 7. Birthday Cake 8. Berenice Peach Skirt 9. McDonalds Barbie 10. Kimbra 11. Mini Crochet Cake Ring 12. Birthday Cake 13. Kimbra 14. Polly Pocket Birthday Surprise 15. Pink Heart Cake Ring 16. ? OMG I'm obsessed with that dress!! I need to check out that esty shop now! Oh my goodness. You look like a DREAM! Love it so much! Love the moodboard. Love everything! That dress and you are both fabulous. I definitely want some cake now. My favorite cake... probably red velvet.. mmm! Best dress ever! I adore that pic. Best dress ever!! !You are amazing in it and I love your cake inspired moodboard so much! !You are always an eye candy, can't wait to see your next posts! I love this dress on you! I'm such a Kimbra fan! I always love her outfits!! Love it! You remind me of a puffy pink cake! 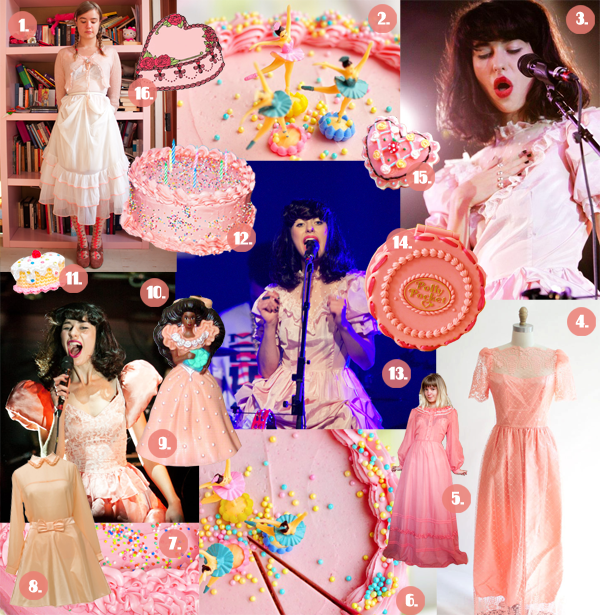 now that you've pointed it out with the moodboard, this could totally be one of kimbra's stage dresses! This is beautiful - these are the types of dresses I love but would never have the guts to wear out. girl, you look so cute! AHHHHHHHHHH i am dying over this. you are too perfect. oh my word, you are a girl after my own frilly heart. I just adore this outfit from head to toe. You look too cute for words! Oh Kailey, you are WAY too cute. This is definitely a birthday cake dress!! Also, I am totally obsessed with that Sweetapolita cake also. Too bad I don't have the patience to make something like that! Pretty sure that I had that Barbie as a child. Also, I see there is a lot of Kimbra. Don't you just love her?! I'm going to be seeing her in NYC shortly. I'm too excited for words! You look absolutely fabulous and darling! You look gorgeous in that dress! Omg I love your hair. And your pictures are great. The framed one in the side bar is perfect. This one is perfect. The grass is lovely and it nice and bright and that little house in the background has a great color. I feel like I'm in a Anne of Greengable's book (but with more cuteness). The best cake I ever tasted was chocolate (my 16th birthday cake). It had this creamy chocolatey paste in between and the same as topping. It was delicious and soft dreamy. I had a picture of Ofelia (drowning) put on the cake, because the theme of my party was death. We also had a cake fight, but my mom cut the cake before so there would be some to eat. Ok, long comment haha. Bye. OMG you look totally awesome! I'm in love with this dress and it really suits you! <3 I have no idea if it was ok on another person <3. Ok now I want some cake! ;P I absolutely love the dress and the moodboard! Kailey you HAVE to try a Madonna Inn cake someday, that dress looks just like their pink champagne cake. I would so mail you a slice if I wasn't worried it might get destroyed on the way. Can't wait to see what you've got coming up, I love it when you post! UGH I literally gasped when I saw the dress ohmygodohmygodohmygod PERFECT. You are a vision of cakey perfection. Oh, and it's an unoriginal answer, but the icing on Costco cakes is to die for. Ah this dress is so fantastic and fun! I love it! It definitely reminds me of cake too and boy do I love cake. I'm actually getting pretty excited about eating birthday cake in about a week. And then eating it for breakfast for days afterward. mmm, this is wonderful! I used to have some birthday cake lip balm and your mood board reminded me so much of it that I could almost taste it. My favorite cake is my mom's recipe! it's incredible. I adore your blog - your outfits and hair are stunning. I'm definitely following! Fabulous dress. I love the translucent sleeves. The best birthday cake is the cake we make ourselves, because birthday cakes bought from shops are way too sweet. Your dress is one of the prettiest things that I've ever seen! Please tell me you wear that dress out! I would never be brave enough too, but its such a fantastic dress! Icecream cake has always been my favourite :) but I never even liked normal cake until about a year ago because I'm a massive weirdo, and even then I only like it with massive servings of cream/icecream haha. I love your dress! It looks perfect with your hair. you look like Kimbra's kid sister...and that you both should be Barbies..
"KIMBRA and her kid sister Kailey!!" You're the cutest!! Love the dress & your style!! fun! makes me want to play pretty pretty princess! That dress is so tremendously sweet and adorable! I love pink and ruffles, too, and would have swooped in on that piece in a nanosecond, too. While it might not have been the most elaborate, fancy, or expensive, to my mind the best birthday I've ever had will always remain the classic homemade chocolate one with seven minute (aka, "marshmallow") frosting my mom used to make each year for me when I was a little girl. waw your blog is so cute! and you hair is hyper cute! Omg Kailey, your dresses are always so dreamy and seem to come straight out of a Disney movie! I want this!! The best cake I ever had?? You're talking to someone who is utterly obsessed with cake. I love carrot cake, red velvet cheesecake, funfetti cake (I seem to make this one the most actually), white cake with choco-frosting, german chocolate cake and...I can't think anymore. All of a sudden I'm starving. That dress is fantastic. It looks like you stole it from a Disney princess. I don't particularly like cakes, however my mother makes an excellent chocolate cake(similar to a death by chocolate cake). Oh my goodness! It's such a princess dress, I love it. your dress superb! It looks perfect with your style. You are my new favorite person for posting this. SO much gorgeous!!! I love Kimbra! her sense of style is so lovely and different, its always so refreshing to see her at gigs and in music videos. your whole blog is utterly stunning i look forward to seeing more! holy cow you are the cutest ever!! I've NEVER seen anyone pull off vintage like you do girl. P.S. so happy to have you on the ol sidebar! What is the name of the etsy store you found that beautiful dress on?? Maybe my device is acting up, but I can't seem to find a link or a name in your post. You look lovely!